Get the high-class treatment on your trip to Taipei 101 with this 6-hour experience, including an observation deck ticket, a private guide, dinner, and shopping credit. Skip the long lines and make your way up to the top of the 1,253-foot (382-meter) skyscraper to watch the sun set. Your private guide can show you around all 91 floors. Enjoy dinner on the exclusive 36th floor while taking in 360-degree views of Taipei. End your night by spending your shopping credit at the building’s mall, full of international designers. For this 6-hour experience at Taipei 101, go to the attraction’s customer service center on Level B1 of the mall area at 4pm to check in and get your evening started. Your private guide takes you to the indoor observation area on the 89th floor. Spend some time soaking in the atmosphere up above the city, and listen as your guide tells you more about the skyscraper’s history. Also, enjoy views of sunset on the outdoor observation deck on the 91st floor. Next up is dinner on the 35th floor at Moon Garden Restaurant. 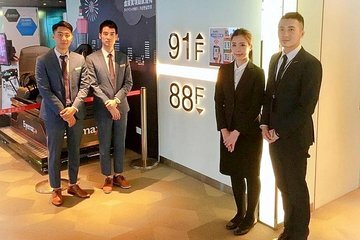 With 360-degree views of Taipei, it’s a no-brainer why this restaurant is not a place all tourists can get reservations easily. Choose from a plentiful menu of Taiwanese and western-style entrees, such as braised pork over rice and lasagna. Afterward, your guide takes your group down to the mall area to spend your shopping credit. The mall covers five floors and is full of exciting stores, including a wide variety of designer brands and souvenirs. You are welcome to stay at the mall until closing time — hours vary depending on the day of the week.